They said it couldn't be done, but Coolerado proved them wrong. The indirect evaporative technology used in the Coolerado air conditioner defies conventional wisdom. It results in power savings of up to 90% compared to conventional compressor/expansion systems, without adding humidity to the product air. 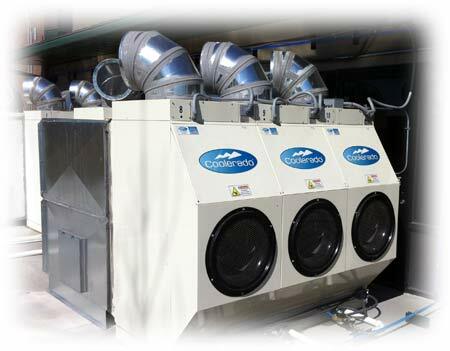 When Coolerado Corporation (Denver, Colorado) first inquired about a controller for their novel indirect evaporative air conditioning system, it all seemed quite straight forward. The main challenge was interfacing a specific humidity sensor element to our controller. That happened a few days after the initial contact, when we shipped them an off the shelf SPLat suitably modified to use the sensor's decidedly non-standard interface. Six weeks after initial contact we had developed a product specification and secured an agreement to build a prototype custom controller. The first prototypes were delivered 9 weeks later (including a Christmas break), fully programmed with an application program. At the same time we supplied a Windows program that allows Coolerado to look deep inside the controller and know what it is doing, including readouts and data logging of humidity, temperature and critical internal parameters. That program also allows simulated sensors readings to be forced into the program, to check the program's performance under extreme conditions. The math involved is particularly interesting. The Coolerado air conditioner is literally propelled by a set of mathematical equations. Coolerado engineers conveyed their expertise to us in the form of detailed spreadsheets. SPLat software developers replicated the equations in SPLat floating point math, and verified the results against the spreadsheets across the whole range of conditions. The prototype, along with the companion Windows program, quickly became a major development tool for Coolerado, giving their researchers an even deeper insight into the whole cooling process. The close teamwork between Coolerado and SPLat has resulted in a product that has received many industry awards and official confirmation from US state and federal test laboratories.